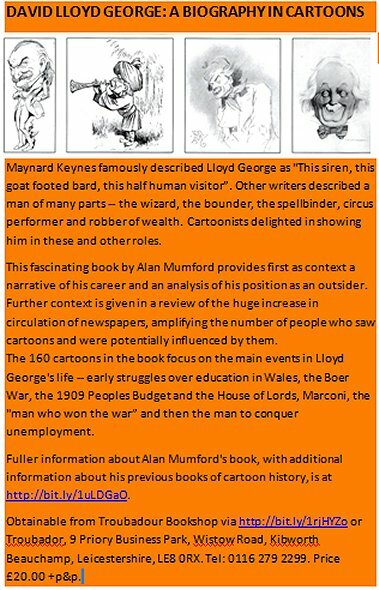 Alan Mumford, leading collector of and expert on political cartoons, has produced another in his brilliant series of political cartoon biographies, this time of that always fascinating character David Lloyd George, the Welsh wizard (the one before Nye Bevan). Illustrated with numerous contemporary cartoons of the great but controversial man, some of them not previously published in modern times, the book’s text includes a highly readable potted biography of LG followed by an informative and lively commentary on the cartoons themselves, setting out their historical background and explaining political references in them with which the modern reader might be unfamiliar. Not all the cartoons are designed to be ‘funny’, but nearly all make an often sharp political or personal point with more impact in a smaller space than a paragraph of writing could hope to achieve. Full disclosure: Professor Mumford and his wife Denise are among my own and my wife’s oldest (in both senses!) friends. Before Alan embarked on publishing his cartoon collection books, he had been the author and co-author of many authoritative and much esteemed books on management and management training. For details of all these you can do a search for ‘Alan Mumford’ on Amazon. More information about this eminently collectable book is provided in the book’s flyer, including links to the page devoted to the book on the Lloyd George Society website and to the relevant page of the publishers’ website where you can order a copy of the book for the modest sum of £20 (+p&p). Please click on the picture below to see the full-size flyer and to access in it the web page for buying it. PS: If you enjoyed the Mumford collection of Lloyd George cartoons, you’ll be sure to enjoy equally my own book describing “What Diplomats Do: the life and work of diplomats” — details and link to order form with generous discount here.